Posted in What's New on 3 April 2019 by Maria GOH. Posted in What's New and tagged luminus on 6 March 2019 by Kenneth PINTO. CIT has acquired a campus-wide license to use Poll Everywhere for classroom collaboration and communication to support both formal and in-formal learning. With Poll Everywhere, instructors can create a higher level of engagement and class participation. Student using their wireless devices can ask and answer questions, participate in polls and vote on questions raised by the instructors. All leading to higher class participation and better feedback. To join our introductory session, please register here. Posted in What's New on 18 February 2019 by Maria GOH. CIT senior director Ravi Chandran was a guest speaker at the International Symposium on Education Reform: Schools as Creative Physical Work Environment for Teachers with case studies of Singapore and Japan. 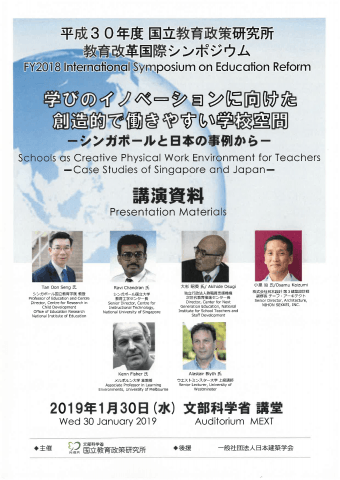 This symposium was held on the 30th January 2019 organised by the National Institute for Educational Policy Research (NIER), Japan. CIT’s senior director’s topic was on Learning Spaces and Design at the National University of Singapore. Posted in What's New on 15 February 2019 by Maria GOH. Before Semester 2 begins, we will hold several hour-long LumiNUS online information sessions. Find out updates from the previous semester, what is new with LumiNUS and how to prepare for the official launch in August. Posted in What's New and tagged luminus on 2 January 2019 by Kenneth PINTO.